What effects do laws and surveillance have on the exercise of freedoms online? 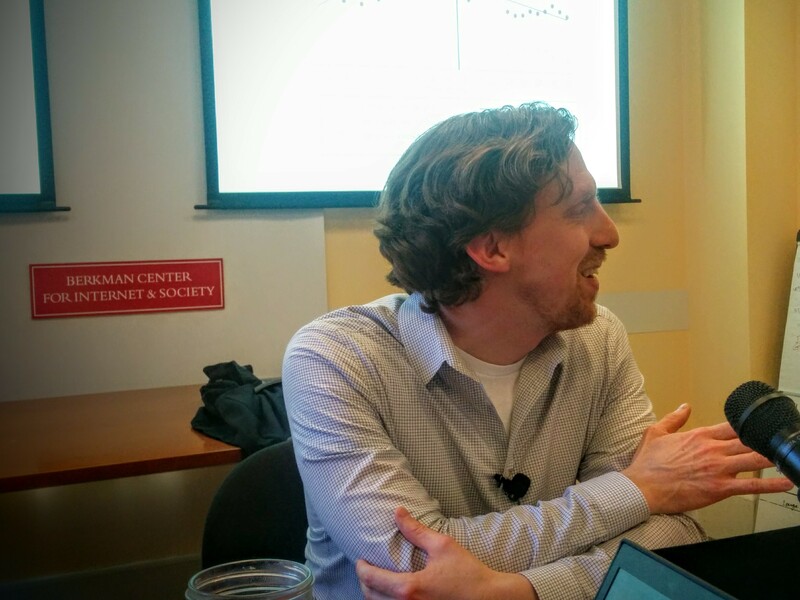 Today, the Berkman Center welcomed Jon Penney (@jon_penney), who is finishing his D.Phil at the University of Oxford, to talk about his dissertation research on chilling effects. Jon is a lawyer, Oxford researcher, and a research fellow at the the University of Toronto’s Citizen Lab. What is a chilling effect? The idea, theorized in a US context by Schauer in 1978, was that laws might have an effect on legal, protected, and desired activities. Judges have been skeptical about this idea. In Laird v Tatum, judges claimed that chilling effects were not a ‘cognizable’ injury. In response to recent NSA cases, chilling effects were dismissed as too speculative. Scholars agree. Kendrick argued that chilling effects have a “flimsy” empirical basis. Many open questions remain, including the magnitude of chilling effects and their reach. In his dissertation, Jon set out to answer some of those questions. How do you prove a negative? Jon points out that this challenge is one of the reasons that chilling effects have been so difficult to identify. Datasets of online behavior offer resources that can help us answer these questions in greater detail. Jon promises to offer two case studies with us today. In June 2013, Edward Snowden released information about the US surveillance system PRISM. By 2014, Pew found that 2014 people had “heard” of PRISM. Matthews & Tucker (2015) looked at Google search activity and found a 5% decrease in Google searches on sensitive topics after June 2013. In March 2015, Wikimedia and the ACLU brought a lawsuit against the NSA, saying that pervasive surveillance had a chilling effect on participation. Jon asked this question in his work, using an interrupted time-series design to examine traffic for sensitive content before and after revelations about NSA surveillance. What Wikipedia articles did he include in the study? Penney focused on 48 Wikipedia articles that corresponded with U.S. Department of Homeland Security “terrorism” keywords. The articles in this set received a total of 81 million views over the period of study. Jon checked these articles by asking Mechanical Turkers “if you knew the Government was monitoring online, how likely would you to be avoid them?” On average, the survey showed that this was content that would give some internet users cause to avoid them. Jon’s research also normalized the traffic to these articles to overall traffic on Wikipedia. What did Jon find? Firstly, he found that after the Snowden reports, sensitive content experienced a drop-off. But over time, people started to realize that they probably wouldn’t go to jail, and the trend continued to increase over time. But there’s a problem: there are two extreme outliers. What were these? Both of those outliers represent Israeli operations in Palestine, leading large numbers of people to read articles about Hamas. 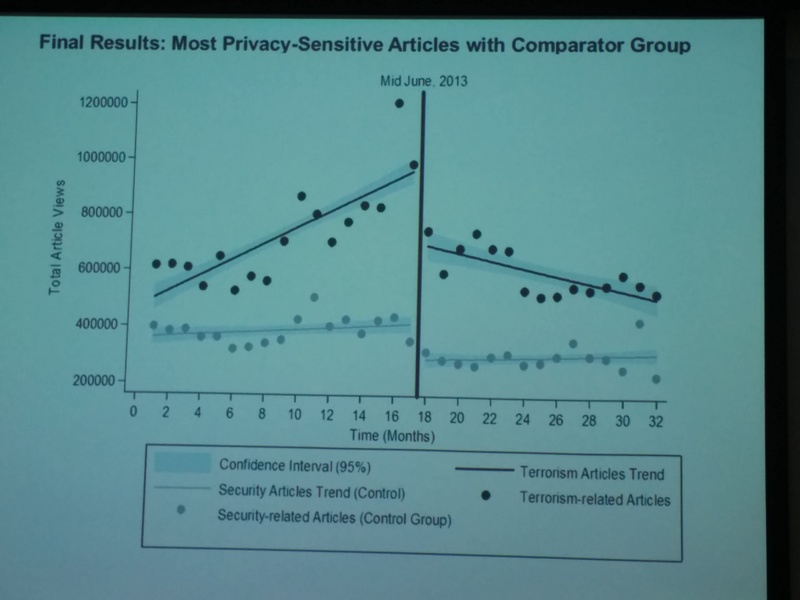 In a second analysis, Penney developed a comparison group of security-related, non-terrorism articles from the same homeland security list. He also looked at the subset of potentially-chilled articles that were rated as most risky by Turkers. In this final analysis, he showed that among those articles, not only did fewer users read Wikipedia pages about those articles, the trend line reversed — the traffic to those articles declined over time. 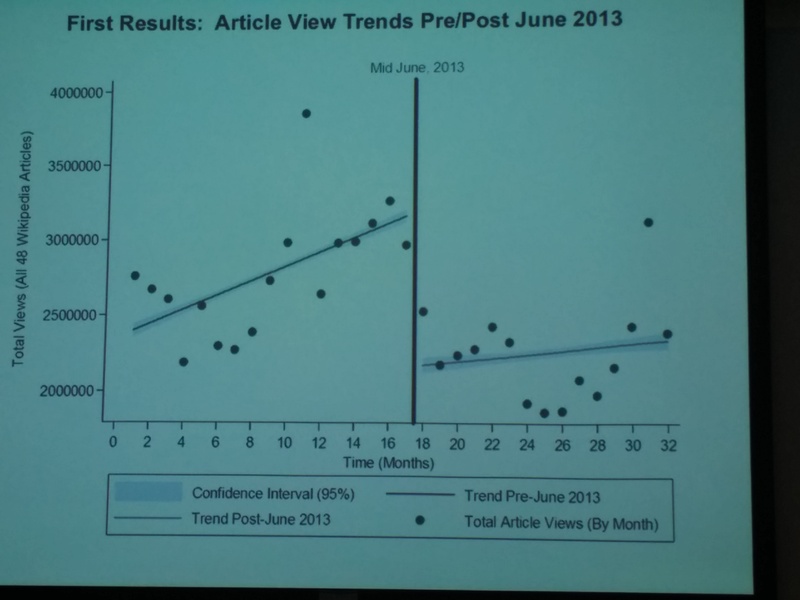 In contrast, the comparison group did not have a reverse in trend lines. Penney suggests that there might be a long-term, ongoing chill from surveillance. Do copyright laws like DMCA have a chilling effect on speech? Next, Jon tells us about the DMCA “notice and takedown” copyright enforcement scheme, a statute that aims to police and enforce copyright on the internet. For example, imagine a blog on Google blogs. Imagine that some blogger has posted a video without permission. 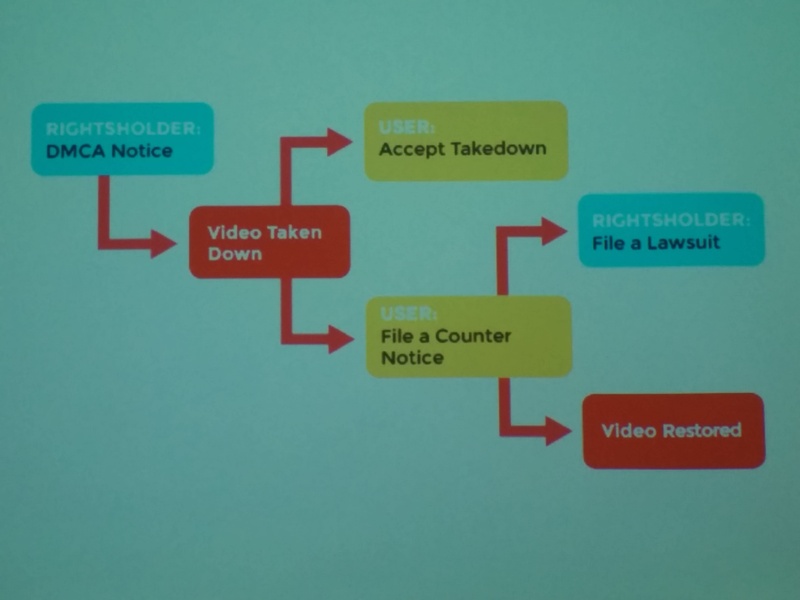 The rightsholder sends a DMCA notice to Google, who will then take the video down. The blogger can then decide if they want to accept the takedown or file a counter-notice. If they do file, the rightsholder can file a lawsuit. If not, the video is restored. What was the impact of the DMCA? Of the 500 notices, 88% of the content targeted by the notices was offline or inaccessible. 12% was still accessible. Among blogs that were targeted through the DMCA, 43% of the blogs were still there, the blog was suspended in 32% in the cases, 13% of the blogs were deleted or relocated by the user. Jon also analyzed the targeted content for potential legality. Across several categories, Jon found substantial percentages of likely-legal content that had been taken down, where the blog had been suspended or the person had deleted or relocated their blog. When challenged, users aren’t replacing the content and leaving it offline, even if they have a good case for keeping it online. Penney also found no evidence of counter-notices — people very very rarely challenge a DMCA takedown. Both case studies suggest the existence and persistence of regulatory chilling effects, says Jon. Secondly, Penney suggests conforming effects of these regulatory regimes, where people avoid certain information or leave content offline. Yet he’s not sure if there’s a single overarching theory to understand these effects. In the case of the DMCA, there might be a specific legal punishment that people fear, but perhaps surveillance is a . Finally, Penney’s findings suggest that there’s a huge potential scale of chilling effects. With 1 billion takedowns per year, a chilling effect at the size of 7% or 10% could be affecting very large numbers of people. Could you talk about the choice of your comparison-related terms? Jon answers: this is one area of the study where I would like to enhance the sophistication of the comparison group. I wanted to avoid the bias. I considered a random sample of articles, but if you gather a group of random wikipedia articles, it’s probably going to track certain trends that different kinds of events are going to influence. If I had to added articles about Justin Bieber, for example, it would be too different from terrorism content, such that whatever trends you would get would be too different. Instead he used what he called a “normative matching” approach, in the absence of a randomized trial. I asked Jon if findings like his ever have impacts on courts, and what that path looks like. Jon: one of the challenges over constitutional litigation around surveillance is that there have been concerns about how to “prove” these claims. They’re often described as subjective, speculative, “non-cognizable” injuries. Many of these fall down on the grounds that people don’t have a standing to prove that they have been injured. 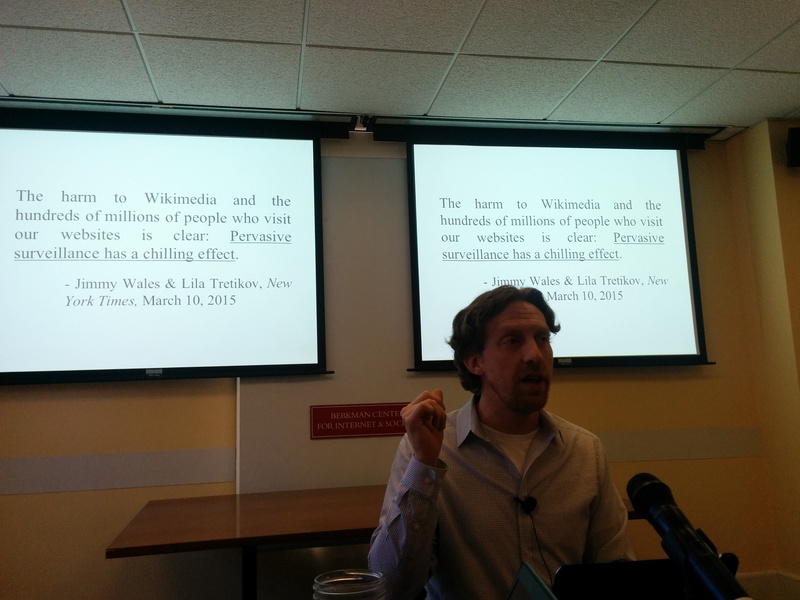 Wikimedia lost at the first instance in the federal court, especially on standing grounds. Jon is hoping that having an empirical foundation for these kinds of claims might help the Wikimedia litigation and potentially other surveillance litigation. In other litigation, survey studies about chilling effects have been cited by briefs filed with courts. They’ve been successful sometimes to persuade courts. Penny identified basically three routes for influence. One impact comes through methodologies that others could use when demonstrating they have experienced harm. Another impact comes through specific legal cases drawing attention to Penney’s research to argue that chilling effects are real and that their specific complaint should be taken seriously. Finally, findings like Penney’s could be shown to lawmakers as they consider similar regulations, to show them the side-effects of certain kinds of policies. What might we do to reduce chilling effects? Penney replied that it’s important to reform laws, which can be informed by empirical findings. Platforms also have a role; Google has been a leader in this area by providing all takedown notices to the Lumen project and supporting research. If more companies provided data to Lumen and collaborated more with researchers, they might be able to develop novel approaches to protect speech rights while responding well to the law. What are the economic impacts of chilling effects? Jon notes that chilling effects can hurt public value in nonprofits like Wikipedia and can also hurt platform revenue, when they push users away from platforms.